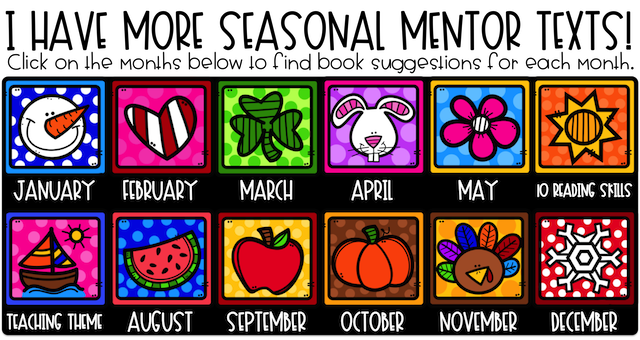 Since it is summertime and so many of us are already in planning mode for next year, I wanted to utilize my Mentor Text series post this month to share books to help you teach your students about THEME! I repeatedly saw this book online and had to get my hands on a copy, and it totally lives up to the hype. In my opinion, there are multiple themes that are demonstrated in this book. This Bad Seed had a traumatic experience that really changed him. After that, he did bad things just because he was labeled a bad seed. It's the perfect book to start conversations and learn a great lesson or two! Monique struggles with the requirement of wearing a uniform each day to school. She wants to stand out and be different. Her classmates follow her lead and begin wearing funky glasses, big hats, and doing anything they can to spice up the dress code. In the end, Monique finds a really great way to be unique! I had heard of this book many times, but I had never actually read it until I attended a conference. After getting the opportunity to read it, I had to use it to teach theme! While the pictures and simplicity may seem like it is only for younger students, the core theme in this book is deep. It only takes one person to stand up to people who try to bully or treat you poorly. This story is just silly, but so enjoyable, even for my older students! In a world where all the Hueys are the same, what happens when one begins wearing a sweater? This book pairs so well with Unique Monique, as one of the Hueys becomes a trendsetter as he works to stay true to himself. What do you do when you don't fit in with the forks or the spoons? It's hard to know who you are! In this silly book, Spork learns that everyone has a purpose. Everyone has a role that they are meant to do. Plus, who doesn't love a good book about sporks! When you have everything you could ever need or want, it's easy to get frustrated when bad things, like breaking your leg, happen. It seems like your world is going to end. Meanwhile, when someone is getting everything that you want...it's even harder! Champ and Walter become friends when Champ learns that Walter's kindness counts more than all the shiny things he "needs". First of all, how can you read this title and NOT want to read the book?! This book is perfect for teaching your students to be who they are--no matter how crazy, silly, unusual, or different that may be! I don't care who you are, at some point in your life you have wanted something that "everyone else" had. In this book, Jeremy desperately wants Those Shoes. Everyone has them, but his grandma says they are too expensive. This heartwarming story shares what happens once he finally gets his hands on a pair! Ooooh, this book is one of my all-time favorites. It is a great story with multiple themes and is perfect for demonstrating that the grass isn't always greener on the other side! Year after year, my students love using this book for a close read. We go together like Peanut Butter and...Cupcake?! This book makes my fifth graders LAUGH! It's right up their alley with a little bit of humor as well as a good theme. Plus, look at those illustrations. Ever wanted an imaginary friend? Meet Beekle. He really wants to BE someone's imaginary friend. No matter what though, no one picks him. But with a little bit of patience, he sees that waiting for the perfect best friend is worth the wait. This book is wordless, so you can use it for teaching students to make inferences as well as spotting an amazing theme about kindness. I love the illustrations and the idea of making someone new feel welcome. I've used a LOT of these mentor texts in my Theme Units, which are sold in my TpT Store! 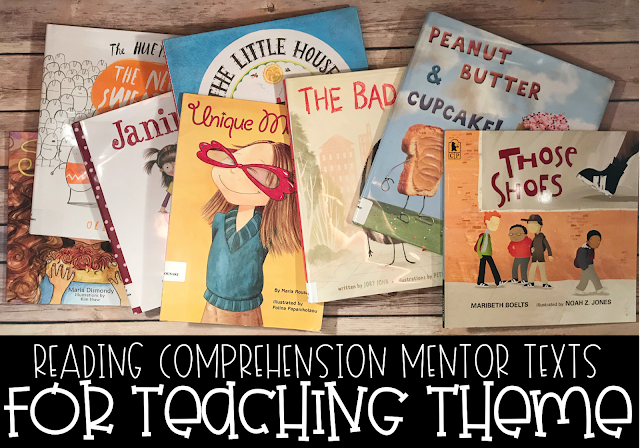 I have questions for the mentor texts, Power Point presentations, assessments, and centers for teaching your students to really dive deep into understanding theme. I love your "Theme" worksheet to use as we are reading the book. Where can I get a copy? So my question is about The Bad Seed. If the theme I was going with was that positive change is possible for everyone what evidence would I be looking for in my students work? I love these book suggestions and your theme sheet to go with them. Is there a link to get the sheet?